Bon Scott was a Scottish-born Australian singer and musician, best known for being the lead vocalist and frontman of AC/DC. He is widely regarded as one of the greatest vocalists and frontmen in the history of rock music. Born Ronald Belford Scott in Angus, Scotland on July 9, 1946, his family emigrated from Scotland to Australia in 1952 when he was only six years old. Scott attended North Fremantle Primary School and John Curtin College of the Arts until he dropped out at the age of fifteen. It was while in high school that he was given the nickname “Bon”. Bon had a difficult youth full of neglect, crime and abuse. After spending a few months in juvenile institutions for a number of minor offenses including theft and unlawful carnal knowledge, he even tried to escape from Fremantle Prison. He gained interest in music after working a few odd jobs. Bon started his first band, The Spektors, in 1966 and served as their drummer while sharing occasional lead vocals. It wasn’t, however, until in 1974 when he gained widespread recognition as the frontman of the hard rock band AC/DC, after replacing their lead singer Dave Evans. He recorded six albums with the band and became a worldwide celebrity with 1979’s Highway to Hell. Bon shared the writing credits of the title song with Malcolm and Angus Young. The album was AC/DC’s first album to peak inside the US charts. Bon, unfortunately, was not a part of the grand success of the band’s next album, Back in Black. He was drinking heavily at a night club in London and died of acute alcohol poisoning on 19 February, 1980 inside a friend’s car. There have been a number of conspiracy theories involving Bon’s death, but none absolutely proven. Back in Black would go on to be their biggest-selling album, as the band had decided to hire Brian Johnson as the new vocalist. When AC/DC was inducted into the Rock and Roll Hall of Fame in 2003, Bon’s family members attended the ceremony in his place. He was cremated, and his ashes are buried in the Fremantle Cemetery in Fremantle, Western Australia. 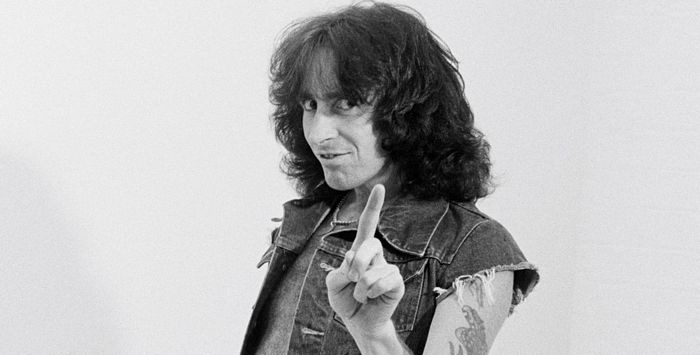 Bon Scott was rated as number one in Classic Rock’s July 2004 list of the “100 Greatest Frontmen Of All Time”. He was ranked fifth on Hit Parader’s 2006 compilation of the 100 Greatest Heavy Metal Vocalists of all time. Bon Scott married Adelaide girl Irene Thornton in 1972. His bronze statue was unveiled in 2008 at Fremantle Fishing Boat Harbour in Western Australia.